I’d been hiking for eight hours up into the Julian Alps – the mountainous region of Slovenia bordered by Austria to the north, Italy to the west and Croatia to the south. I was trying to make it to one of the 180 alpine shelters before sunset. I clambered over open, sometimes unforgiving, alpine terrain reaching for iron cables and handrails during the lengthy and rocky vertical climb at Kamarca Crag. Exhausted, achy and thirsty, I eventually arrived at the Triglav Lakes Mountain Hut (1,685 metres), a hostel-like lodge that sleeps and feeds 100 hikers. I gingerly tossed my pack on my paper thin cot in my dorm – I’d be spending the night with 12 others in a postage stamp-size room but was so tired I knew sleep would come fast and deep. I made my way to the outside deck on worn out, jelly legs, with a carefree plan to chase a cold beer with the view; the fading light was being painted across the Seven Lakes Valley – its vertical walls seemed to cradle the high mountain meadows that swept their way toward the hut entrance. More from First Person: I’ve just found out my son is on the spectrum. Now what? On reaching the front door, I stood beside a hut employee talking – no, yelling – into a cellphone. His tone was harsh, his comments accusatory. He was chastising someone on the other end, whom I could also hear – and she was panicked. Other hikers now gathered around like trail ants to an apple core; hearing the word “lost” is unsettling for any hiker. We knew quickly that a real life, high drama was unfolding under the growing shadow of Mount Triglav. And that’s when the unexpected happened. Long pause. At first puzzled, my brain, still slow-turning like molasses from the day’s exertion, eventually understood she could only be referring to me. I met no other Canadians on the trail this day, and no other hiking pack belonging to my hut mates was adorned with the red maple leaf, as mine was. She must be asking for me. “Good,” the staffer shot back, “You talk to her.” He handed me the phone. At rapid-fire pace, the voice announced herself as Maia, an Israeli woman whom I had met on the trail earlier that afternoon with her trail mate. Getting no sympathy from the lodge employee, she thought quickly to ask for me. “Please, Joe, can you help us? Can you try to find us?” Longer pause. 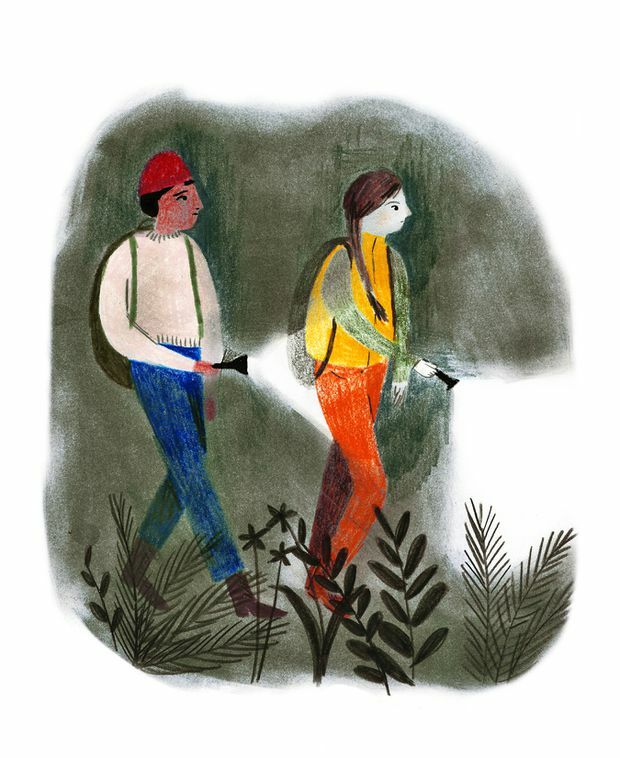 Several thoughts raced through my mind: First, lost hikers, disoriented and often scared, can sometimes make bad decisions that lead to injury or worse. Second, I have no training in mountain rescue. Third, this is a big responsibility; if I fail to find Maia and her friend, what will be the consequences? Maia and I quickly devised a basic plan. Using crude estimates, we agreed that she and her hiking partner were likely closer than they were distant from the hut. I would backtrack to the nearest trail marker, 30 minutes away. I would repeatedly sound my emergency whistle, and hope it carried across the darkening valley and through the tall trees to, at least, provide an audible trail toward safety. After hanging up, the enormity of the task set in. Just how was I going to organize a successful mountain rescue? That’s when the German cavalry showed up. It took the form of three experienced and good-natured German alpinists, who had just returned from summiting the area’s highest peak, Mount Triglav. They unselfishly offered their expertise, their maps and to join me in the search. I wanted to hug them all. We moved quickly in the fading light to gather what we needed – a working cellphone, head lamps, warm clothing, extra water, topographic maps and first-aid kit. Then we were off. Thirty minutes later, we were at the trail marker. Our whistles carried across the shadowed valley. Nothing. We repeated. Again nothing. We hiked further down, carefully tracking our route using red and white way markers painted on rocks along the now blackening trail. Again, we whistled, yelled and repeatedly tried to hail Maia by cellphone. Nothing. I thought again and longed for that cold beer. After near 90 minutes of anxious searching, Maia answered. She had heard our whistles! But they were still off the trail and still lost. We quickly exchanged estimated co-ordinates – then the line went dead. I was buoyed by the news that Maia and friend were safe and could hear us, but night was falling. We were running out of time. We kept heading down. Then, spotty cell service came through to give us a second chance. Before we lost connection, Maia relayed good news quickly – they were back on the trail, and could see the hut in the distance. They were safe. What’s more, they were above us on the trail, much closer to a hot meal and cold beer than we were. Four cheers! We turned and started the hard climb back up to the hut, guided by the light of our head lamps and the glow from the grins of relief on our faces. When we reached the hut some two hours later, there were hugs, cheers and rounds of cold beer, courtesy of Maia. We spent the remainder of the evening recounting the literal and figurative ups and downs of the rescue. I came away from it all with new friends. As I lay in my mountain cot that evening, exhausted but exhilarated, I wondered if I’d have to make another life-or-death decision on my adventures. When that time comes, and I’m asked if I’m from Canada and can help, what will I say? I’ll say yes. Joe Doiron lives in Dartmouth, N.S.